This schematic shows the experimental setup developed by UAB researchers to transfer energy between two circuits. Image: Jordi Prat. Wireless charging could represent the next great technological advance in mobile devices. Some mobile devices can already be charged wirelessly by placing the device on top of a charging base, but the real goal of charging devices without even having to take them out of your pocket might be just around the corner. By taking advantage of metamaterials, a group of researchers from the Universitat Autònoma de Barcelona (UAB) in Spain has developed a system that can efficiently transfer electrical energy between two separated circuits. This system is currently still in the experimental stage, but once perfected it will be able to charge mobile devices wirelessly at longer distances than currently possible. Today's wirelessly-charged devices make use of induction for charging, employing a specially-adapted case and a charging base connected to an electrical socket. When the device is placed on top of the base, this generates a magnetic field that induces an electric current inside the case, allowing the device to be charged without the need for any cables. If the device is separated from the base, however, the energy is not transferred efficiently enough and the battery cannot be charged. The system created by UAB researchers overcomes these limitations. It is made up of a metamaterial that combines layers of ferromagnetic materials, such as iron-based compounds, with conducting materials such as copper. This metamaterial encases both an emitter circuit and a receiver circuit, allowing energy to be transferred between the two, at a distance and with unprecedented efficiency. Using the metamaterial, the researchers were able to increase the efficiency of energy transmission 35-fold in laboratory experiments. "And there is much more room for improvement, since theoretically the efficiency can be increased even more if conditions and the design of the experiment are perfected," explains Àlvar Sánchez, who led the research. 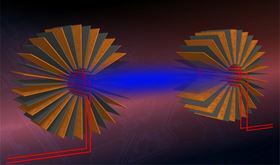 "Enveloping the two circuits with metamaterial shells has the same effect as bringing them close together; it's as if the space between them literally disappears," says Jordi Prat, now at the Institute for Quantum Optics and Quantum Information of the Austrian Academy of Sciences in Innsbruck, and lead author of a paper in Advanced Materials describing the research. Moreover, the materials used to construct the metamaterial, including copper and ferrite, are widely available. The first experiments conducted with the aim of concentrating static magnetic fields for wireless charging required the use of superconducting metamaterials, which simply wouldn’t be practical for everyday use. "In contrast, low frequency electromagnetic waves – the ones used to transfer energy from one circuit to the other – only need conventional conductors and ferromagnets," explains co-author Carles Navau. The metamaterial has been patented by the UAB, and companies from several different countries have already shown interest in developing the technology. The research was funded by the PRODUCTE project of the Government of Catalonia, the European Regional Development Fund (ERDF) and the Spanish Ministry for Economy and Competitiveness. This story is adapted from material from the Universitat Autònoma de Barcelona, with editorial changes made by Materials Today. The views expressed in this article do not necessarily represent those of Elsevier. Link to original source.